The $100,000 (pounds 62,500) Frankfurt eBook Award aims to recognise publishing and technology achievements in the emerging electronic-book industry. The winner will be announced at October's Frankfurt Book Fair, the biggest event in the publishing calendar. The prize money is intended to rival other awards such as the IRpounds 100,000 (pounds 83,000) Impac or the pounds 30,000 Orange book prize, awarded earlier this week. As well as $100,000 for the best original e-book, there will be $10,000 awarded in each of five categories, including the best fiction originally published in e- book form, best non-fiction in e-book form, best fiction and non- fiction originally published in print and converted to e-book form and an award for technological achievement. Alberto Vitale, former chief executive of Random House, is chairman of the International eBook Award Foundation, which will select the winners and present the award. "The e-book industry will ignite a worldwide change in the way we publish, distribute and read books. The awards are a fitting tribute to further encourage this evolution," Mr Vitale said. The award is sponsored by, among others, Microsoft and e- publishing companies such as Contentville, Nuvomedia and Glassbook. Judges for the award will come from academia, the media authors and other publishing industry professionals. "Authors are creating exciting new works in e-book form, and readers are responding enthusiastically," said Len Kawell, President of Glassbook Inc. It is predicted that by the end of the year there will be 500,000 electronic books. 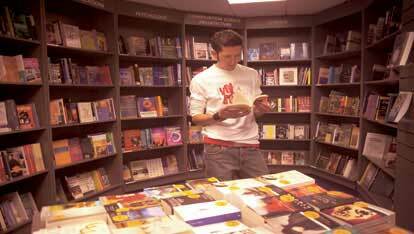 An average bookshop may carry 50,000 to 70,000 titles. In the past six months the US company Barnes & Noble has expanded its e-book list to more than 2,700 titles. Thirty million hand-held book readers - light, portable screens - are expected to be sold in the next five years, each capable of holding up to 10 full-length novels.